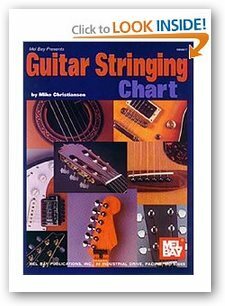 Guitar String - Is Stringing A Guitar Easy To Do? "Finally! A guitar string replacement page with so many tips (a video) that are actually useable..."
"I hear I forget...I see I remember...I DO I UNDERSTAND!" Like most things in life, we have to "get our hands dirty a little" before we get good at something, so don't be afraid to make mistakes. Stringing a guitar is no different and it's one of those jobs like guitar tuning that you just can't avoid. Now a few little tips before we begin the text.. When replacing a guitar string you should really change one at a time, not all of them at once. It is not good for the neck of the guitar to have such a release of tension and then to have it applied so forcefully later. It easily could lead to distortion of the neck and permanent damage. Another tip when changing a string is never tune the strings more than a tone above its normal pitch. If you do it could lead to breakage., Sometimes if, you tune a little sharp, say 1 semitone above normal concert pitch, it can make your guitar sound just that little bit "brighter" in performance, and this can be a good thing. To go beyond this is risking breakage, so take it easy. Also, NEVER put steel strings on your classical guitar because it is not constructed to take such exertion and can be very easily damaged. I remember a student of mine several years ago did just this and the neck broke away from the body of the guitar at the heel and completely ruined it! Nuff said? When I'm changing a string, whether it's a student's or my own, I always start with the 1st "E" treble one. I use my tuning fork to get the "A" note (440 Hz) on the 5th fret and am then able to tune the others as I go. If you've got an electronic tuner, then I suppose it doesn't matter which one you start with. First of all, unwind the old string until the tension is completely released and it's quite "floppy". Then un thread the string from the Capstan in the Headstock. Next, untie it from the bridge and discard it. Did you know that in Fernando Sor's time that guitar strings were called "catgut"? They were not actually made of cat gut as such but were made mainly from the intestines of sheep! Using sheep intestines for a string? No way!!! After threading the string through the eye you extend it about 10 to 12 cm beyond the bridge. This will allow you to wind it around itself 3 times before you pull up the slack. I feel it is more secure because, as you can see from the picture, it is wound around itself 3 times. Be careful you don't have too much overhang as it tends to rattle and vibrate annoyingly against the body of the guitar top. The next step is to thread the string through the hole in the Capstan in the Headstock. I like winding the it once around closest to the outside of the headstock and on the next "turn" cross it over to the inside of the Headstock. Then I keep winding the slack on this side until it's wound to its proper tension. Make sure you "feed" the string through the little slot in the Nut, so it is in the proper position when you tighten it up. 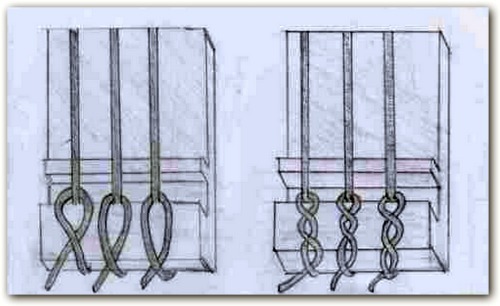 The second method of changing a guitar string (above on the right hand side of the graphic) is a little safer as you tie the string in a little knot then wind the rest of the slack around until tuned. When you become experienced at stringing a guitar you'll notice that it becomes much easier, and less time consuming to do. There is no rush! Take your time and do it slowly at first because it is well worth learning properly. You'll have much less slippage and breakage or even tuning problems if you learn to put your guitar strings on properly in the first place. Be advised that they'll take some time to "settle in" as the strings continue to stretch as you use and tune it. It all depends on how much you tune and play your guitar as to how long it takes for the them to stay in tune. 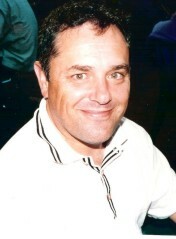 As a rough guide, it usually takes my new ones between 2 to 5 days to settle down. A good tip if you're regularly replacing a guitar string is to stretch the strings yourself. 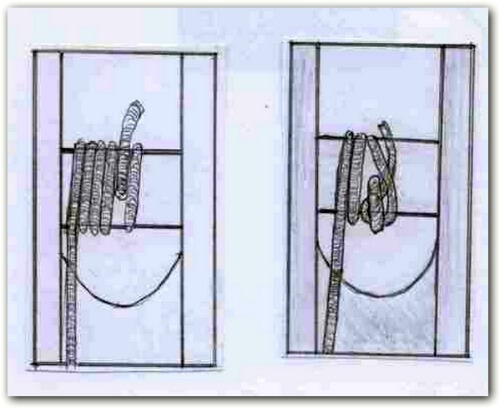 This is achieved by pulling them outwards from your guitar along the length of the string from Nut to Bridge. I then play all the semi-tones (fret by fret) along the string length then re-tune them. This technique should stretch them more quickly and so make it settle down and stay in tune.